Two years ago I wrote a short story for publication in a book that our writers' group put together. The story was entitled The Justus Encounter. With Christmas coming faster than I wish to admit, I thought I'd share this story with you. Greetings, friend. My name is Justus. Each year at this time my mind drifts back to that bitterly cold night when deity took on humanity in a musty animal stall behind an inn in Bethlehem. We were the last family to secure lodging inside the bustling hotel. When my wife Sarah, my daughter Eunice and I arrived every room was spoken for. The innkeeper graciously lent us a small cot, one blanket and a resting place in the corner of the entrance hall. Our family had journeyed to Bethlehem to be accounted for. Caesar Augustus had ordered a census be taken throughout the Roman empire requiring citizens to travel to their ancestral hometown. We lived in Bethany, a little to the northeast of Bethlehem, and had traveled by foot to “the city of David”. I was thirty years old at the time and little Eunice was just an infant. Exhausted from the trek, Sarah and Eunice quickly dozed off. I sat on the floor by the cot but sleep eluded me. About an hour later another road-weary couple burst into the inn. The woman was obviously “great with child” and her husband – I assumed they were married – requested a room. 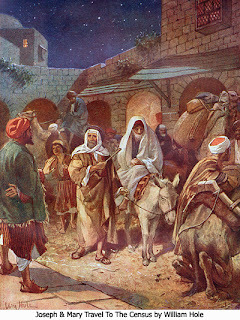 The tired innkeeper advised them that there were no vacancies but that they could find shelter in a stable behind the inn. He offered them a horse blanket or two to ward off the cold but they declined. As they left I felt constrained to hand them our only blanket, the one the innkeeper had lent us. They hesitated momentarily but accepted my offer. I finally nodded off to sleep, my head resting on the corner of Sarah’s cot. After a brief nap I awoke to the raucous clatter of a dozen or more shepherds. Some even had lambs in their arms as they burst into the inn. They were talking excitedly and inquired where the Saviour, the Messiah, could be found. The innkeeper, hearing the commotion, stumbled to the counter. “Where’s the Messiah?”, they queried. “A host of angels announced on a hillside outside of town that a baby has been born in a manger and He is to be our saviour.” The bewildered innkeeper re-directed them to the stable out back. The sheep herders had awakened Sarah and little Eunice with their exuberance. Eunice was crying and Sarah was frustrated by the interruption. Me? I was wishing they’d hurry up and go out to the stable to find this promised Messiah. Imagine a band of angels announcing a newborn King to a motley crew of shepherds. Sounded kind of crazy to me. Guess I’m a sceptic at the best of times. I get irritated by people who get their directions from heavenly voices. The commotion died down as the shepherds went to investigate but then built to a crescendo as they discovered that the Messiah had, in fact, been born in a cattle manger of all places. They woke everyone in the inn, the whole town I’m sure. We didn’t get back to sleep. What a night! The next morning we registered for the census after sunrise but I was grumpy for the rest of the day. You know how you get when you don’t have a good night’s rest, when you’re in someone else’s bed or on the floor. This Messiah, Jesus, grew up in his father’s home in Nazareth. Mary and Joseph were his parents, the couple I had given the blanket to. I discovered later that they weren’t even married that night. Scandalous! I learned that she had become pregnant by the Holy Spirit. Now that was hard to believe! I’d never heard anything like that before but, as I said, I was sceptical of everything. Back in Bethany we heard a lot about this man called Jesus. He helped in His father’s carpenter shop until he was about thirty years old. Then he began preaching around the countryside. He visited our town several times. Mary, Martha and Lazarus, neighbours of ours, were friends of his. One day Lazarus died and his heartbroken sisters sent for Jesus. They were upset when Jesus didn’t arrive until four days later. According to the townsfolk He supposedly raised this man Lazarus from the dead. If you ask me, he was likely just asleep, unconscious or in a coma but not dead. Raising a man from the dead was a little far-fetched for an unbeliever like me. That all changed one day, an event that’s indelibly etched on my mind. Our daughter Eunice was about thirty-two years old at the time. She hadn’t married, was still living with us and was working as a seamstress. She became violently ill one evening and we thought she would die. She was bleeding profusely and was very feverish. Several times we thought we had lost her. Sarah ran to Martha’s house and was surprised to learn that Jesus was staying with them. Hearing of Eunice’s condition, Jesus came quickly. Our eyes met as He came through the doorway and I knew in that moment that He was more than just a man. I was strangely moved! He quickly made His way to the room where Eunice lay and gently placed His hand on her forehead. Immediately the fever vanished. The bleeding stopped. Eunice sat up in bed, instantly healed and I bowed before this man called Jesus, a changed man. Belief filled my heart where scepticism and doubt once ruled. Jesus prayed with our family, pronounced His blessing and quickly was gone. I’ll never forget the look of compassion in His eyes. The next morning the thought crossed my mind briefly that I should tell Jesus that it was my blanket that cradled Him on that cold, frosty night in Bethlehem but I quickly realized that He already knew. He was God and He knew everything. I was changed forever by this encounter with the One I had rejected for so long. Don’t be a doubter like me. Investigate His claims. Read the biblical account of Christ’s life. Seek out a Christian pastor or friend if you want to know more. Jesus Christ is everything the angels said he would be and He will change your life. Just give Him a chance! Amen, amen and amen...excellent story David. Thanks for sharing as we will soon be in the Christmas season.